Who knew the owner’s manual could teach us as much about ourselves and self care as it teaches about the bike? Understanding the fundamentals of motorcycle maintenance enhances safety, performance and longevity while reducing costs. It also builds self confidence, awareness and independence. Here are seven facets of self, developed through motorcycle maintenance. Motorcycle: Routine maintenance, inspections and replacing parts proactively keep our bikes running in top condition. Using high quality and specialized cleaners keep it looking good for a long time. Lesson: Body, mind and soul are no different. They need regular care to function optimally and allow us to flourish. Caring for them respects who we are. Motorcycle: We learn by doing. Start with the routine things, like checking tires for wear, air pressure, oil level, chain tension and lubrication (if there’s a chain drive). Not only will our bikes perform better and last longer, they’re much safer. After all, they’re carrying precious cargo. Lesson: Taking care of ourselves with healthy eating, positive thoughts, exercise and meditating forms a solid foundation on the rest of our personal and professional life flourishes. 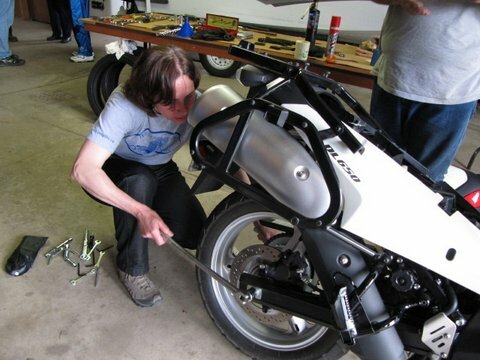 Motorcycle: Other than a tire pressure gauge, the tools that come with our bike are all we need to get started. Lesson: Motorcycle maintenance teaches us it’s easy to make things much more challenging and complex than they need be. Click to tweet quote. Often, when we look around, we find we’ve got more than we need to get the job done. Motorcycle: Once we get rid of the thoughts that tell us we won’t succeed, we realize trying something new wasn’t so difficult after all. In fact, usually we want to learn more! Lesson: Accomplishing something we thought was out of our league prepares us for the next challenge. We learn we’re capable of far more than we gave ourselves credit for and are inspired to try new things. Fear of success can be just as paralyzing as fear of failure. If we can do the thing we thought was impossible, what else will be called to do? Motorcycle: Basically, a bike is a piece of metal and other materials on two wheels. Yet so many people shrink away from even the simplest maintenance, thinking it’s beyond them. It’s all objective and rational, with no emotions to complicate things. While we may choose not to get too technical, we may surprise ourselves with how easy the basics are to understand. Lesson: We don’t know what we’re capable until we’re put into a challenging situation. Too often, we’re tempted to give up before we start because we’ve convinced ourselves something can’t be done. Or we’ve been told we can’t do it. Think of the message that’s playing to our subconscious. Motorcycle: We don’t know what we don’t know. Hence, we get out on the road with no idea what could go wrong, nor would we be prepared if it did. Routine inspections confirm it’s in good repair, alert us to potential problems before they get out of hand and give us an idea of how to proceed if something goes wrong. Lesson: Success starts with being open to trying new things and achieving results. Each success builds our confidence and carries the seeds for new growth. Motorcycle: Working on our bikes not only helps us understand how it works, it also reassures us that it’s been done right. Furthermore, it prepares us for dealing with mechanics on more complicated issues – and even sales people when we’re researching our next bike. Lesson: When we’re continuously learning, we’re building up an arsenal of resources that we can draw on as the need arises. We’re also in a better position to be of service to others. Before you go for your next ride, take a few moments and learn something new about your bike. You’ll be amazed at how empowering it is! This post continues exploring the themes introduced in Life Lessons From Motorcycles: 12 Principals of Survival.